Prof. Janet P. Jaco, CPUES Principal together with the CPU Elementary School faculty and staff. 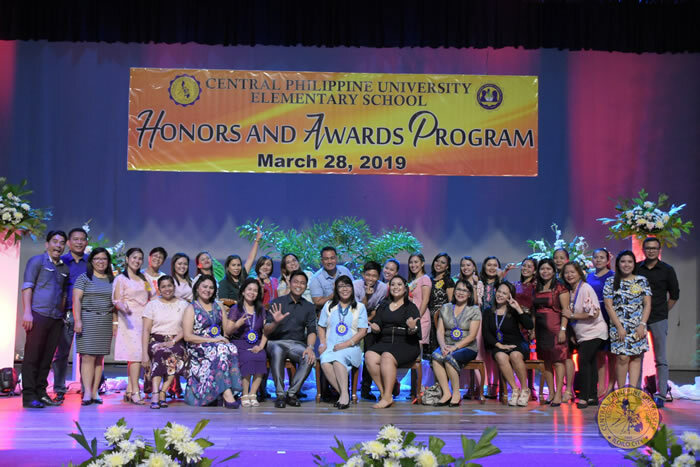 Celebrating God’s faithfulness to CPU and honoring our young achievers – the Central Philippine University Elementary School held Honors and Awards Program at the Rose Memorial Auditorium on March 28, 2019. The CPUES Boy Scout Marshalls led the Entrance of Colors. Rev. Ruth G. Lunasco, Christian Education Director, University Church gave the opening prayer. It was then followed by the singing of the Philippine National Anthem by Viza Gale Q. Espada, Grade 5, Excel. After which the scholarship and incentive awards, special awards and sports awards were given. It was then followed by the presentation of the academic awardees by Prof. Janet P. Jaco, CPUES Principal. The awarding of academic medals by the parents was assisted by Dr. Robles, Dr. Rio, Prof. Jaco, Ms. Donna D. Jimena, Assistant Principal and Dr. Carmen P. Santos, Consultant. Rev. Francis Neil G. Jalando-on, Director, CPU Office of Communications, led the prayer for the awardees. For the closing remarks, Miss Ruth Marie B. Trance, Chairperson, Honors and Awards Committee congratulated the awardees, their parents and the CPUES faculty and staff and God almighty for the blessings received this school year 2018-2019. It was followed by the singing of the Alma Mater Song led by Viza Gale Q. Espada, Grade 5, Excel and then, the recessional.